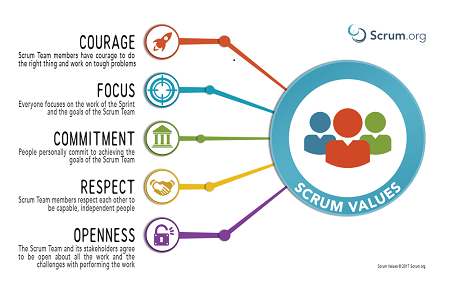 "How do I know if my team are demonstrating the Scrum Values? What can I use to show their current state?" What Questions Did I Use? If I see something that is wrong with what I'm being asked to do, I will say so. I will question & reproach my team members if I feel that they are doing something wrong. Regardless of the person talking, I will correct them if I believe that they are incorrect. I will stand firm if I believe I am right, even if I'm in the minority within the group. I always know what the sprint goal is and how my work supports it. I do everything I can to ensure we achieve the goals of the sprint. In my current team, I have never thought of taking a sick day to avoid going into work. I always arrive on time for the events, my colleagues never have to wait for me to start the event. I know what it means to say that an item is done, i.e. I know the criteria that meets our Definition of Done. Whilst working on a story I do not get distracted. If I am not enjoying the work in a story I still give it the attention it needs. When enjoying working on a story I will not over work a story just to prolong it. I do not procrastinate when working on a story. As soon as the story is ready to move into a new state, I will tell my colleagues and either hand it over or ensure that they know it is ready to pick up. I do not hide away difficult issues in the hope that they will sort themselves out. If something / someone is annoying me I will address it / tell them. My colleagues can judge what state of mind I'm in, I can share my feelings with my them. I always say the true state of an item, and do not over/under play it. I listen with equal intensity regardless of who is talking. When listening to people I never talk over them. I value everyone's opinion equally. I am never concerned who works on what item in the backlog. I feel that my opinion is respected and that I have an equal say in the team. To support & encourage one of our colleagues to focus on Respect. How? We're working on that one but we know it is an issue. The whole processed enabled the team to talk more freely with each other. 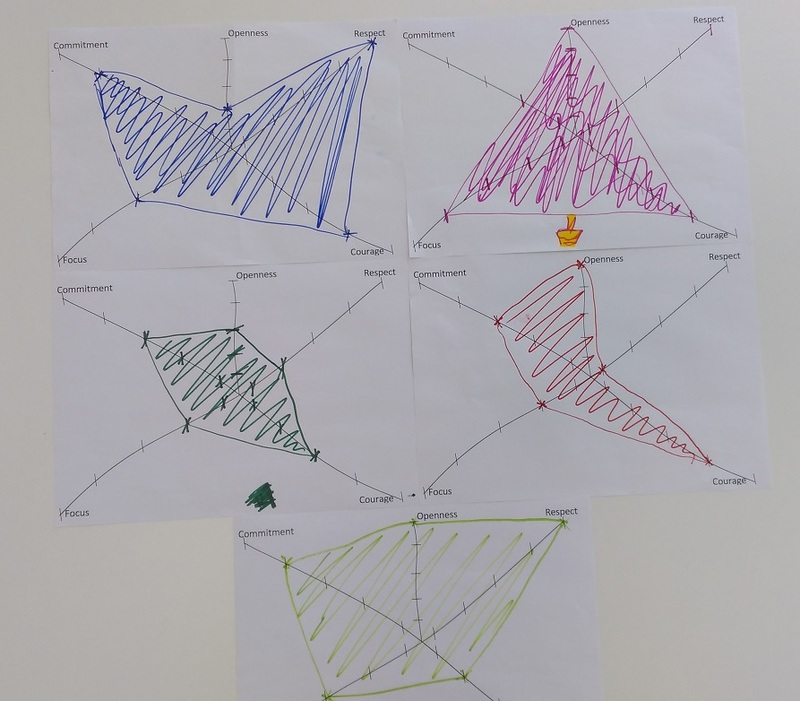 We discussed the outliers and generally felt positive that we were open with each other. 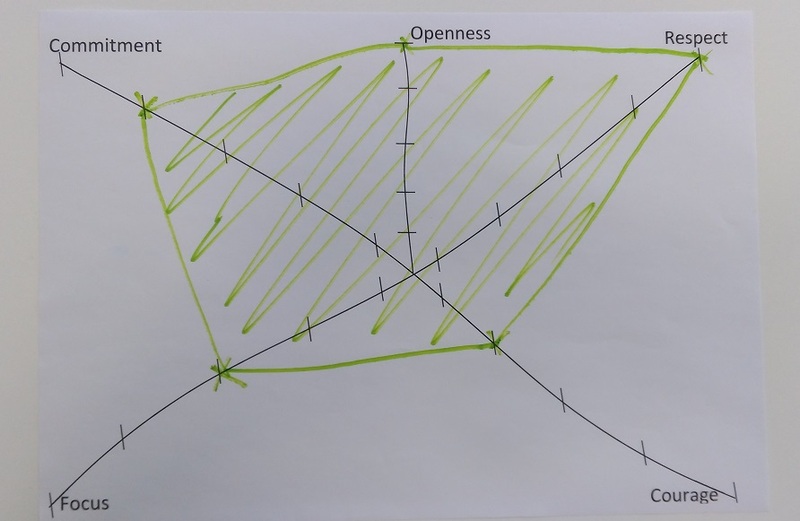 My role as a Scrum Master was to look at the areas where people recorded low against some key areas, (Respect, Courage and Openness) then encourage improvements in these areas?